The True North Youth Foundation (TNYF) certainly gave a warmer greeting to many of Winnipeg’s newcomers than the winter weather did this year. Though the frigid temperatures may not have been tough to beat, the TNYF once again went above and beyond in welcoming new Canadians to our city and province by showing them how to have some outdoor fun in a chilly climate. 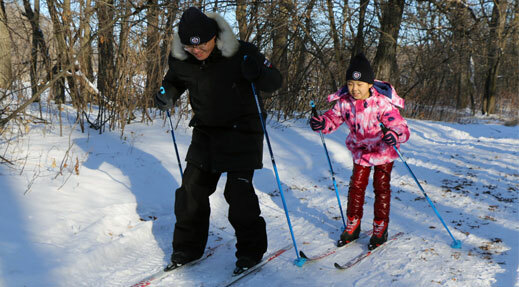 The 2018-19 winter season marked the second year that the TNYF has hosted their Welcome to Winnipeg events. The initiative, supported by a grant from NHL Players’ Association Industry Growth Fund, brings groups of newcomers to Camp Manitou and introduces them to winter activities such as tobogganing, snowshoeing, cross-country skiing, and of course skating. The NHL Players’ Association Industry Growth Fund is getting exactly what it’s looking for out of the program: growth. The Welcome to Winnipeg events have doubled in size since last year. This year, nearly 300 new Canadians participated in six sessions held in December and January. Participants have come from a variety of groups that help newcomers settle into life in Winnipeg, including the Immigrant Refugee Community Organization of Manitoba, the Seven Oaks Neighbourhood Settlement, Welcome Place, and Congo Canada Charity Foundation, as well as groups from Red River College, the University of Winnipeg, and University of Manitoba. The group from the Congo Canada Charity Foundation got to take in the last sessions of the season on Jan. 26, and thoroughly enjoyed it. When the group went skating, they could barely get the kids inside for lunch despite the cold weather.